Norwalk Connecticut's #1 Physical Therapy, Rehabilitation, and Occupational Health Services. AHP Physical Therapy is a boutique multidisciplinary healthcare practice, based in Norwalk Connecticut, dedicated to the highest quality patient care. Our prime focus and expertise are on the physically injured patient. We employ a unique multi-disciplinary treatment protocol that creates the optimal platform for healing. This allows our patients to return to work, sports, and life faster, stronger, and with the tools and knowledge to help avoid re-injury in the future. 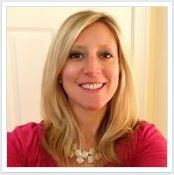 “Patient care and managing my team at AHP-PT are my main focus. When a patient comes to see me for the first time, I enjoy talking and getting to know them. I not only listen in order to understand their injury but also how that injury may be impacting their daily life. My team and I know that while many injuries are common, how that injury affects each person will be vastly different! That is what makes us unique. I want to know – Is your pain keeping you from participating in a specific sport, playing with your children or grandchildren? Is it keeping you from being able to work or sleep? My goal is to make you feel at ease so that you know immediately upon coming to see me at AHP-PT that you made the right choice! I want you to walk out after your initial evaluation and feel confident that I [and my team] have listened thoroughly and have discussed with you how we can specifically help you. I want you to know what to expect with each visit and that we have steps to take you on your unique path to recovery! While I have worked with many doctors in the Norwalk area for the last 20 years, I am also proud to say that many of my patients come from patient referrals.I have treated many of the same patients for different injuries for more than 20 years. In many cases, they have been kind enough to refer their parents, spouse, and children to see me as well should they get injured. My team and I have filled our facility with the best providers, equipment, and modalities to help any patient get out of pain. A prime directive is also to teach you, our patient, how to take better care of yourself on your own – during and after care. We want to be a “chapter in your life.” A chapter that began with an injury journeyed through education and rehabilitation and ended with you not only understanding how the injury occurred, but how to avoid a reoccurrence, and finally; the tools to maintain a healthier lifestyle than before you were injured. I value a natural approach to healthcare and regularly utilize chiropractic, acupuncture, massage, exercise, proper nutrition, naturopathy in addition to traditional medical into mine and my family’s healthcare needs. Knee pain can really impact life. Stopping us from living the lives we want. Keeping us from doing the things we used to do. But what exactly causes knee pain? What can we do to stop it for good but avoid surgery? There are answers and solutions. 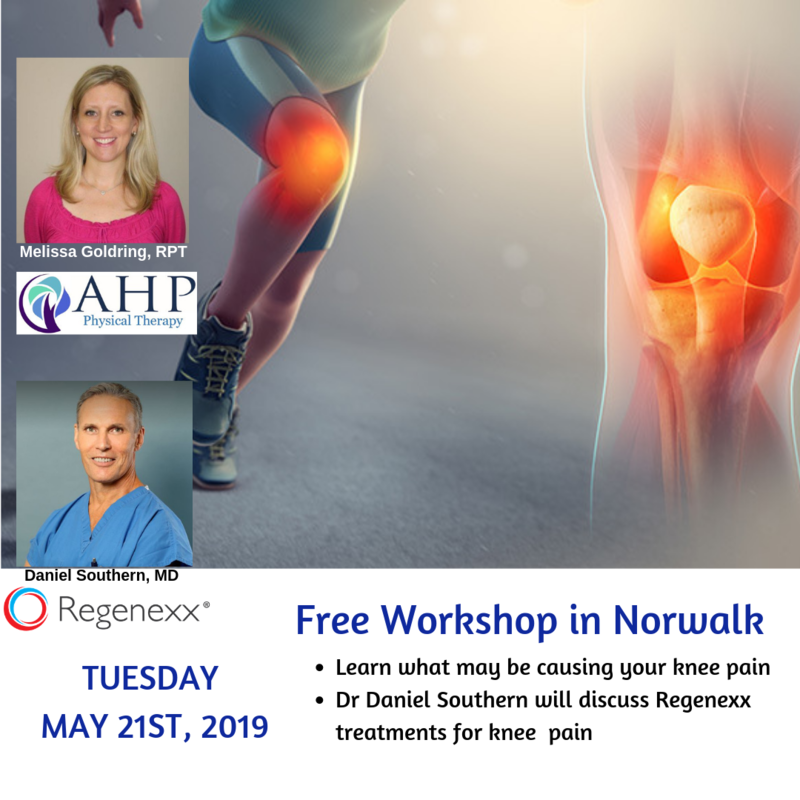 Join Dr. Daniel Southern and Melissa Goldring, RPT on Tuesday May 21st, 2019 at 6:30 PM to learn more about the causes of knee pain and what non-surgical approaches are available to end the pain for good! This free one-hour seminar is taking place in our Norwalk office and open for registration! The AHP Physical Therapy philosophy is unique. We offer our patients access to several disciplines which tailors their treatment to their specific needs. They can treat with one of us, some of us, or all of us! Our patients have the benefit of our combined years of knowledge, expertise, and experience! "There are no words to describe what an amazing place this is. From the front desk to the physical therapists it's a 10. I leave my PT treatments feeling as though I never had an issue with pain in my knees. This is the place to be for beyond excellent care." "The staff is friendly and inviting. I truly believe they want their patients to get better and are genuinely concerned about our well being." "Superb Care The staff and environment are absolutely top notch. I definitely recommend visiting them to start recovering and get on your way to better health. There is no pushing beyond your physical limits. The care and attention is focused on you during therapy one on one." "After going to Missy and Evan for about a month, I can definitely say that I am feeling better now than I did on my first day. They are both so sweet, very down to earth, and you can tell that they really care about what they do. AHP has been super flexible with my schedule and understanding if I have to miss an appointment. If you need to book a PT appointment, I highly recommend them." "I can't say enough about AHP. Missy, Diane and Evan and the rest of the team are great. Everyone is very thorough in how they care for you. They really listen and adjust to what you need. The team upfront is extremely helpful in working around your schedule to make sure you get the care you need and when you need it. Thank you!"